The first week of November 2018, 12 Kohanot and Kohenet students converged on the Parliament of the World’s Religions in Toronto, Canada. An over 100-years-old conference that gathers over seven thousand people every three years, it can be easy to be overwhelmed at the Parliament. But we created intimate, meaningful spaces everywhere we went. On Shabbat morning we led Shacharit services. Our slotted time was 7am (!) but we avowed to show up with full priestess presence! We awoke at the hostel at 5am and made our way to the convention center, where a group of us rearranged the chairs from rows to concentric circles, set an altar and hung the umbilical cord at the center. To our joyous surprise, over 50 people showed up to pray with us. We opened with song and drumming, and a land acknowledgement. We prayed in our hearts, bodies, and words. It was the first time for most of us that we were gathering to daven shacharit since the horrific shooting in Pittsburgh exactly one week prior. Before Kaddish, Kohenet Elizabeth called in the names of the 11 Jews murdered in the Tree of Life Synagogue, as well as the two people murdered at the Kroger supermarket in Jeffersontown, Kentucky. We also called in the names of three teenage youth killed in Southern Gaza the previous week. There was a very conscious collaborative effort around the naming of the lost and the language we settled on. Toward the end of the service we were pouring grape juice and preparing the challah and realizing that we did not have enough to offer everyone some after kiddush and motzi. At that very moment, in walked a priestess of the Pagan tradition — her group had been also leading morning prayers in the room next door, and she had come to offer us a large platter of honey-soaked gluten-free bread and a goblet of fresh apple juice! This is the kind of synchronicity/synergy that was happening at the Parliament regularly! Kohenet Shamirah wove the service offerings together into a beautiful printed siddur. You can download our Shacharit service to use in your community. You can watch the service on facebook livestream. For thousands of years, First Nations people have walked on this land; their relationship with the land is at the centre of their lives and spirituality. We are gathered on the traditional territory of the Mississaugas of the Credit River First Nation and acknowledge their stewardship of this land throughout the ages. The territory was the subject of the Dish With One Spoon Wampum Belt Covenant, an agreement between the Anishinaabe, Mississaugas and Haudenosaunee to peaceably share and care for the resources around the Great Lakes. Our meeting place of Toronto is still the home to many indigenous people and we are grateful and humbled to have the opportunity for many of us gathered at this conference to live and raise our families here and engage in our spiritual sharing here today. Jews of many backgrounds have experienced a sense of geographical and cultural displacement over the years. We acknowledge our history of displacement, and as importantly, we acknowledge the ways in which we as non-indigenous peoples and settlers have benefited from colonialism, former and ongoing which has hurt and oppressed First Nations peoples. We ask for your forgiveness at this time. Many of us were slated to speak at the Parliament, and rather than just show up and give an academic presentation on a panel, we brought the feminist spirit of Kohenet into our sessions, moving rows of chairs to create a circle, guiding participants through embodied practices rather than giving speeches, and crafting ritual. Kohenet Ariel spoke on a panel about pluralism, sharing her journey to gender queer identity. Bekah shared her Hamsas for the Divine Feminine illustrations, a series of line drawings inspired by the Netivot, in a session in the Red Tent. The Netivot are aspect or pathways of the Divine as taught by the Kohenet Hebrew Priestess Institute. These cards offer an idea of a visual representation of these aspects of the Divine Feminine. More than 15 Sacred Artist presented their art work and talked about how their different faith traditions inspired their art creating. Purchase "Hamsas For the Divine Feminine" here! Bekah also created Sacred Coloring pop-up experiences throughout the week to introduce the Hamsa cards to Parliament participants. In another session, Eim ha’Derech (Mother of the Way, an honorary Kohenet title) Rabbi Rayzel Raphael introduced participants to the Shekhinah Oracle deck. We sat in a circle - yes chairs had been rearranged again! - and divination-style, everyone was invited to ask a question and then choose a card from the pile on the central altar cloth. We then spent a few moments reflecting on how the card spoke to us. Rayzel was generous with her interpretations as well. Rae also spoke on a panel of women at “Sacred Arts: Creative Expressions of Faith to Heal a Threatened Earth” where again we re-arranged the chairs into a circle and placed an altar in the center. This session wove stories from the panelists Trebbe Johnson, Phyllis Curott, Maya Tiwari, Lyla June Johnston and Rae that testified to the bodily and emotional pain that arises within us when we are disconnected from the Earth, and wove stories of ancestral lineages, faith, and oneness with the earth. Lyla, who is speaker, musician and poet from the Diné (Navajo) and Tsétsehéstahese (Cheyenne) lineages, led the group in prayer as participants made offerings of birdseed and waters into a central bowl. Rae led the group in singing “Water heal my body” as they processed out of the conference room, through the convention center halls, and outside past the sacred fire, and into the streets, where they walked to the edges of Lake Ontario and gave her the water and seed offerings, in prayer for her healthy, well waters. This was the only session Rae participated in (out of so many that were about the environment and climate!) that guided participants outside. 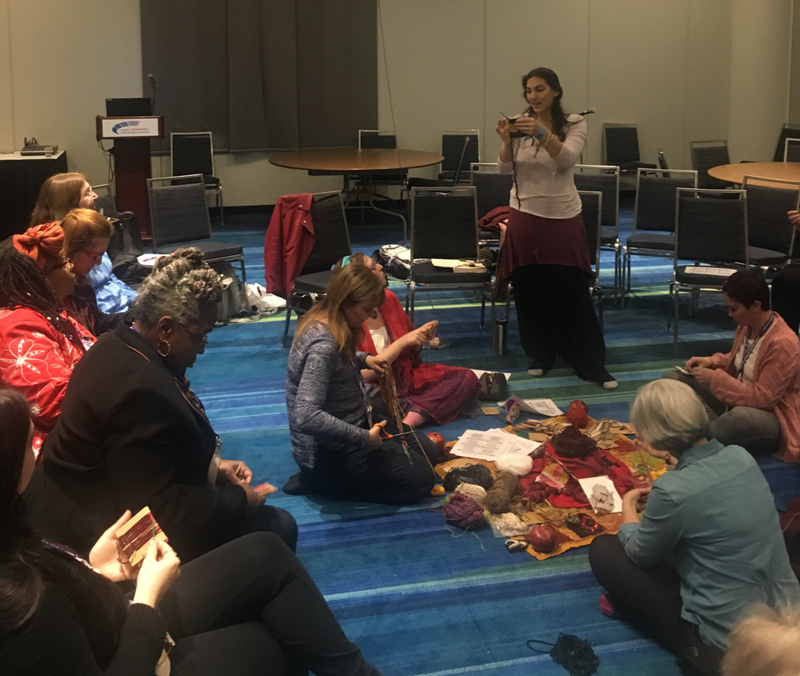 Kohenet student Bekah and Kohenet Annie led “Sacred Weaving,” a session that called forth the weaver archetypes from many traditions, and through song, guided meditation, and hands-on crafting, participants experienced the Oreget, the weaver, firsthand. This session happened in the early evening, and stepping into the room you could witness a circle of women weaving… a sight uncommon to the parliament! We also showed up as participants at myriad sessions, weaving connections between faiths, between people, and forging new relationships. Kohenet Rae Abileah brought the Climate Ribbon to the Parliament, a global storytelling ritual for climate grief and hope that she co-created with Rav Kohenet Rabbi Jill Hammer and a group of artist-activists during her studies at Kohenet Institute. 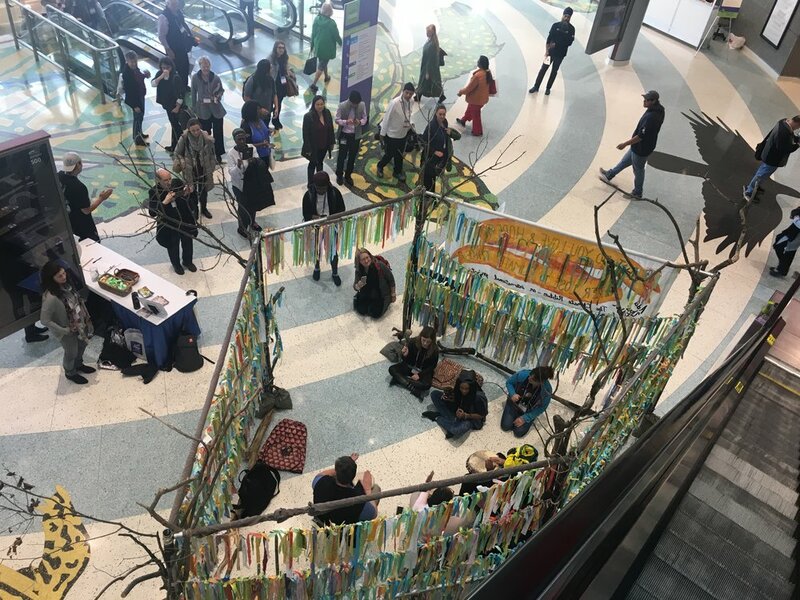 The Climate Ribbon was featured at the last Parliament in Salt Lake City in 2015, and returned this year with an invitation to be a larger, more impactful art installation in the entryway to the convention center. How to transform this looming industrial entryway into a meaningful space for reflection and commitment? Kohenet Annie was on hand to help Rae set up and pulled out her divination cards — the Netivot deck by Kohenet Ketzirah Lesser! Rae pulled the Et/At card, which calls forth a doorway. Annie and Rae took inspiration to build a womb-like grove of trees sculpture with a ribboned doorway. The next challenge was how to find the branches for the sculpture — certainly in the heart of Toronto’s downtown concrete jungle, branches were scarce. Sounds like a job for a Kohenet! Kohenet Orev guided Rae to a forest by describing the various parks in Toronto and their histories and connections to indigenous peoples. And then it was time: In the middle of the night on All Hallow’s Eve / Halloween, Shamirah and Rae journeyed to the forest, and in the dark found felled tree branches. Orev swooped in in a giant orange cargo van for the “great branch schlep” and delivered the branches to the convention center. Once in place, the Climate Ribbon greeted Parliament-goers with brightly colored ribbons, trees reaching to the sky, and a table on which a simple question was placed: What do you love and hope never to lose to Climate Chaos? Participants wrote on ribbons their specific, personal responses, alongside their name, age and hometown, and tied their ribbons to the tree grove, exchanging them with someone else’s, and carrying that ribbon with them, becoming the guardian of someone else’s loved place, and vowing to commit to taking action for climate justice and a renewable energy future. Those of us from out of town stayed together in a bunk room at a local hostel, where convenience and slumber party bonding made up for the frequently broken toilet, lack of personal space, and “wait are we still in our twenties?” vibe. We had a Whatsapp group to text each other with updates on sessions, logistics, and priestess needs like “Can someone bring fresh herbs for the altar to my next session?” followed by, “Sure! Totally have you covered! En route with rosemary and thyme!” or “Anyone have sacred water for a cauldron in room 605B?” or “Hey, come join me in the Red Tent for some bodywork and song!” If only text threads like this existed all the time! It was especially sweet to see everyone’s “homecoming” pictures with beloveds! We hosted a priestess happy hour on Saturday night at Bar East 36 , a gathering that also became Rae’s surprise birthday party! Part of being a priestess is knowing how to convene community for what Trebbe Johnson calls, “radical joy in hard times”. It is also about creating ritual for life passage events, such as Rae’s 36th birthday. And it’s about leading divination tarot readings at the bar! And US Election Night, Annie hosted us for a sweet dinner gathering in her home, where new Kohenet student Sarit Cantor (Tet) joined us to make a full house of priestesses. We also sold copies of the Hebrew Priestess books and Hamsas for the Divine Feminine at the official Parliament bookshop. 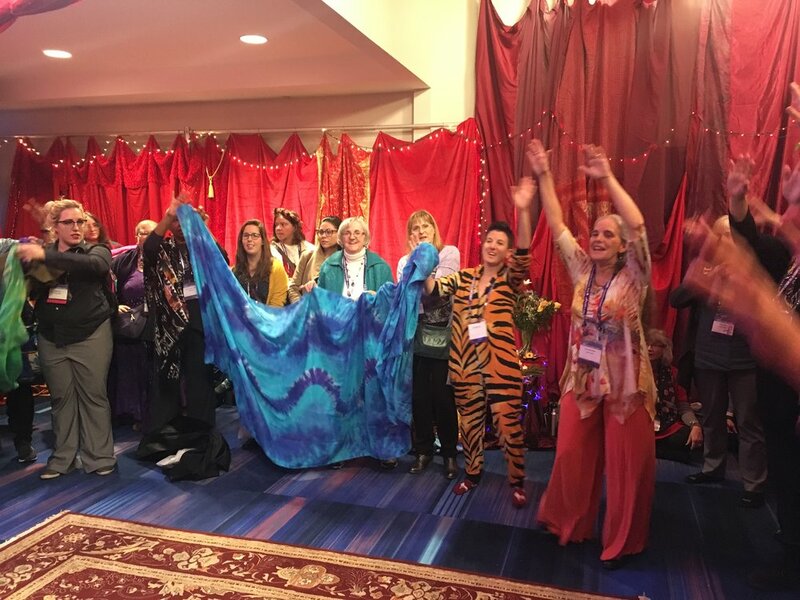 We processed to the Red Tent singing “My body is the body of Shechina” where we entered and continued leading songs… many other women in the space brought their songs. This is the kind of spontaneous weaving that the Red Tent was created for. We closed out our time at the Parliament by processing from the main plenary out of the building, while singing “Where you go I will go… beloved, ancestor, refugee…” by Shoshana Jedwab. We are so grateful to Kohenet Keshira HaLev Fife who had a huge hand in organizing the Kohenet delegation to the Parliament, and was unable to attend as she was present with her Jewish community in Pittsburgh, facilitating healing spaces, creating ritual, tending to trauma, and creating a blockage of love with prayerful song which rerouted Trump’s motorcade . We felt Keshira’s presence with us at the Parliament and her courageous priestessing inspired us to keep on weaving in interfaith community at the Parliament. 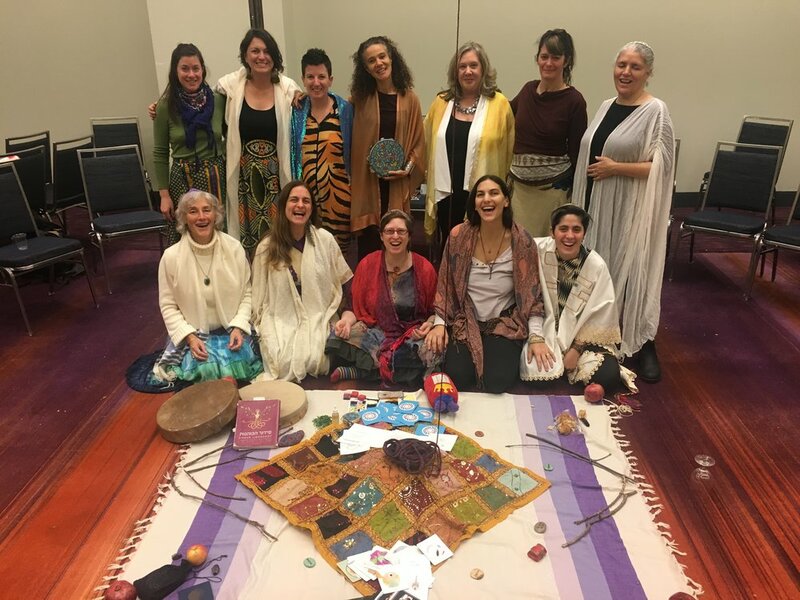 Whether facilitating sessions, speaking on panels, guiding ritual and prayer, creating sacred spaces, singing loudly, witnessing plenaries, relaxing in the Red Tent, Kohenet was a presence on the ground in Toronto at the Parliament of the World’s Religions, and we hope to gather priestesses for many more interfaith conferences and events in the future! P.S. We set a world-record for number of Kohanot ever in Toronto, Canada. Learn more about Kohenet Hebrew Priestess Institute. Purchase "Hamsas for the Divine Feminine" here! Bring the Climate RIbbon to your community by downloading our simple DIY kit and learning more at www.theclimateribbon.org. Find out more about having a gender inclusivity training customized for your organization, office, school, or place of prayer by Ariel Vegosen at www.genderillumination.org. Read about the Kohenet experience at the last Parliament of World Religions in Salt Lake City in 2015.